GRASS VALLEY Calif. October 4, 2018 – Just after 5:15pm, suspects described as black male adults entered the T-Mobile Store on Nevada City Hwy in the Brunswick Basin. Initial reports were that the suspects were masked, forced the employees in the back of the store and robbed the business of numerous devices. They fled in a vehicle towards Hwy 49. 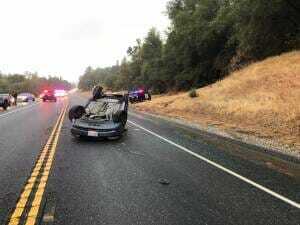 Grass Valley Police officers located the suspect vehicle and attempted a traffic stop, however the suspects refused to yield and took off at a high rate of speed, according to GVPD. The pursuit ultimately ended in a single vehicle collision against the embankment on Hwy 49 near Cherry Creek Acres. One suspect had to be extricated while two other fled on foot, they were located a short while later and taken into custody. No other motorists were involved in the collision, no other injuries reported. The suspects are in custody at this time. This investigation is still in its infancy, and additional information will be distributed later this evening by Grass Valley Police. Hwy 49 is open to traffic and the substantial slowdown is resolving.